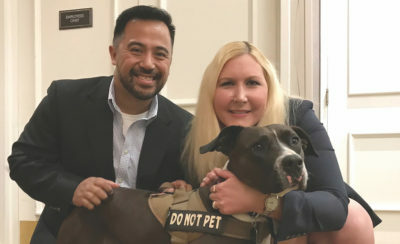 HERA GRRL with her new owner Reuben Roque and Deputy District Attorney Alexandra Campbell. A pit bull mix survived being thrown down a ravine twice. Thanks to a neighbor’s video footage and a homegrown city prosecutor, the defendant is in jail. Deputy District Attorney Alexandra Campbell, who grew up in Hancock Park along with most of her family, received an incriminating video as evidence of the 21-year-old defendant’s deed. “The video’s just heartbreaking to see — how this man treated this animal in throwing her over this ravine on two different occasions,” Campbell said. The defendant, Andres Spancky Raya, threw the dog into a ravine Sept. 26 in the Lake View Terrace area. The dog wandered the neighborhood, and neighbors Krisanto Paragas and Reuben Roque tried unsuccessfully to catch the frightened animal. The defendant was on probation for another crime at the time, and “due to the gravity of the charges, a judge ordered him to be taken into custody. He remained in custody for the duration of the case,” said Campbell. Raya pleaded “no contest” to one count each of animal cruelty and residential burglary. He is serving two prison terms concurrently for a total of five years in state prison. The dog was re-named Hera Grrl when adopted by Roque, a war veteran who suffers from Post Traumatic Stress Disorder (PTSD). “She’s very resilient,” said Roque, who takes Hera to work at the Veterans Resource Center at East Los Angeles College. Paragas was given a Courageous Citizen Award by the District Attorney’s Office. “Krisanto was the one who ‘scared’ away the defendant when he tried to take back his dog” after the second assault, explained Campbell. “I truly wish that Reuben would have qualified for the award, but since he adopted the dog after the crime had already been committed, he did not meet the criteria. “It was a great case. The dog is doing great. She even has her own Instagram page,” added Campbell. The deputy district attorney specializes in animal cruelty cases. A Marlborough School graduate (class of ’98), Campbell has been a Los Angeles District Attorney for the past 10 years. At Marlborough, Alexandra was captain of the equestrian team, and growing up with horses and as a self-described animal lover, she felt obligated to join the Animal Cruelty Unit in the District Attorney’s office. “The best part is that Hera has a wonderful new home. Not all these cases have such happy endings, sadly,” said Judith Campbell, Alexandra’s mom. 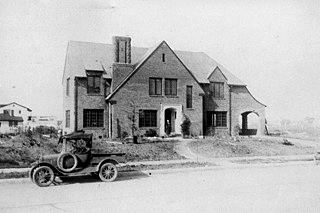 CAMPBELL home in 1926 on Las Palmas Ave., built by George McNee, Alexandra’s great grandfather. Alexandra’s parents, Judith and Alex, grew up next door to each other on Las Palmas. Judith went to Marlborough; Alex attended Harvard School (now Harvard/Westlake). “In 1926, my husband’s grandparents built the house on Las Palmas in which he and his family were living when we met,” said Judith. “My great grandfather (George McNee) built it from scratch,” says Alexandra. Alexandra’s other great grandfather, John B.T. Campbell, was managing editor of the “Herald Examiner;” his son Alex N. was a financial editor there. “Perhaps Alexandra inherited her love of animals from [Alex N.]. He was known for walking the streets of Hancock Park with a bag of dog treats to give to all his four-legged friends,” says Judith. Alexandra was the fourth generation of the family to live in the brick Tudor-style home built by her great-grandfather. She now lives in Glendale, closer to her “off-the-track thoroughbred” who she is retraining to jump. When not working to save other Los Angeles animals, that is.